Data security and privacy is a pretty hot topic right now. Currently Apple is battling it out with the FBI over whether or not they have to unlock an iPhone. It’s nice to know that (at least for now) the data on your phone is relatively safe, if you’ve added a passcode to it. But not everything important that you carry with you is on your phone. What if you need to carry sensitive information on a flash drive? For that, you need something special, like Kingston’s DataTraveler 2000, which I’ve been using for a little while now. The DataTraveler that I’ve been using may have a familiar design. It’s not the first flash drive to use this particular housing, but it’s a design that works. The metal drive is roughly the size of a pack of gum, if not just a little longer. On the end you’ll find a twisted metal keyring, which you can open by unscrewing the connector. On the inside you’ll find 11 total buttons. Ten are your standard alphanumeric keys, and one is the key, or unlock button. There are three total LEDs, one shows the drive’s activity, while the other two indicate whether or not the drive is locked. Around the base where the out casing meets is a rubber ring that helps make a watertight seal. 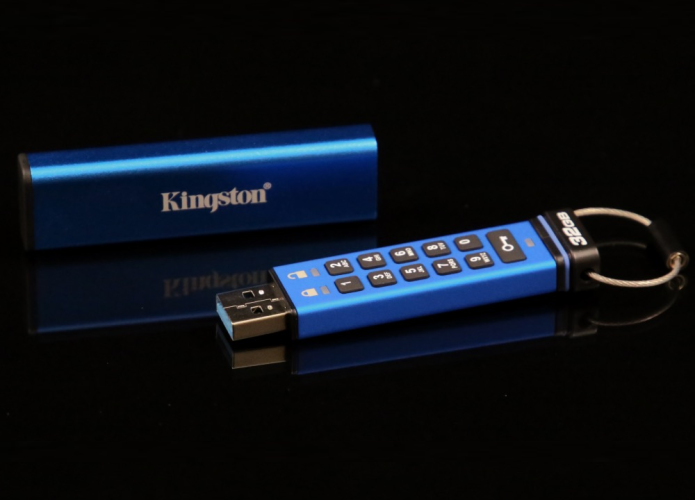 Flash drives are dime-a-dozen, but this one sets itself apart by offering AES 256-bit hardware-based data encryption. All of the encryption is done on the drive, meaning that there isn’t anything you need to install on a computer, or any keys that you have to save somewhere. As such, there is an on-board battery that charges itself whenever it’s plugged in. The drive we tested is 32GB, though there is a smaller 16GB version available. The drive is USB 3.1 (Gen 1) and is compatible with older USB 2.0 ports. I’ve worked in IT for years, and I’ve had to deal with a few different encrypted flash drives in that time. Certain people needed to carry sensitive files, and there’s always the risk of a drive being lost or stolen. The drives I worked with all had software that needed to be installed, and keys that had to be securely stored on a computer. Naturally, on more than one occasion, I was asked to retrieve the data when the key was deleted for some reason or another (which I couldn’t do, because it was encrypted). In short, they weren’t the most user-friendly devices. The best feature of the DiskTraveler 2000 is the fact that it’s so simple to use. There is no need to explain any complicated procedures, or install any special software. All you need to do is enter the PIN and press the unlock button. Then, you have 30 seconds to plug it into a USB port, and your data is ready to be accessed, just like any other flash drive. When you’re done with the drive, it automatically locks the moment it is removed from the computer. There are a few other handy features that you can set on the drive, as well. If you want to ensure that the information on the drive isn’t deleted, you can set it to read-only access, using a few simple steps. If you’re worried about someone leaving the drive plugged in and unattended, you can set the drive to automatically lock after a certain number of minutes that it sits idle. The device does require you to have a relatively secure PIN. It must be between 7-15 digits, cannot contain only repetitive numbers (such as 1-1-1-1-1-1-1) and it cannot contain only consecutive numbers (such as 1-2-3-4-5-6-7). This makes guessing the PIN pretty difficult. To prevent the PIN from being brute-forced, the drive will automatically delete all data stored on it after 10 incorrect entries. In addition to simply deleting the information, the encryption key is also deleted. The drive contains a random number generator, so that in the event that the drive is wiped, a completely new encryption key is generated. The PIN is then reset to the default. As you can see, in terms of USB 3.0 drives, it’s not going to win any awards in the performance department. There are plenty of other drives out there that will blow it out of the water in speed tests. However, this is to be expected from a drive using encryption. And the speeds are still going to be just fine, and actually exceeded the 120MB/s read and 40MB/s write speeds that Kingston lists. As an IT professional, I can’t stress how important it is to make a secure flash drive easy to operate. Sure, it’s great that the information is secure, but if your users can’t remember how to operate it, or they’ve lost the encryption key, it’s pretty useless. The DataTraveler 2000 definitely gets high marks in usability. You quite literally only need to enter your PIN and hit the unlock button, in order to make it work. The design isn’t flashy, but it’s solid enough to take a beating, and still keep your data in tact. While the speeds aren’t going to blow you away, our tests did show it surpassing the specs listed by Kingston, which is always nice to see. Kingston’s website shows the 32GB version running for about $145, while the 16GB version is going for around $117. If you need an encrypted drive to carry around sensitive files, you won’t go wrong with this particular drive.